John Eric Carver and Shrek are a retired Navy SEAL war dog team, now living in the mountains outside of San Diego. Both man and dog thought their life was now settled, finding peace on the forty acre ranch they had moved to. But life, and a mutated virus, changed all that. Note: The Extinction Survival Series is set in the Extinction Cycle universe of New York Times Bestselling Author Nicholas Sansbury Smith. 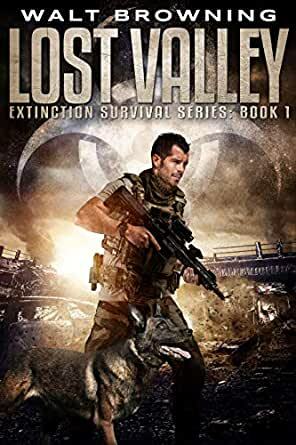 Previously published via Amazon Kindle Worlds, Lost Valley is now being offered in print, and audio for the first time ever. Readers outside of the USA will also get to experience these stories for the first time. Thank you for reading! This one starts with Shrek, German for Ghost, he's a Belgian Malinois Military War Dog. Shrek is the best at all that he does. He and his human partner John Eric Carver a US Navy SEAL, served three tours in Afghanistan before Carver retired two years ago. He served for nineteen years and that last tour Shrek has scented an IED that had exploded but Carver lost his ear drums making him unfit for duty. He decided to retire and return to California. He had the option of taking Shrek with him and he did. Shrek has saved he and his SEAL teams lives more times than Carver could count. The dog had a nose that scented out IED's and other explosives. A trait that served he and the SEALs well. Right now Shrek and Carver are at Carvers California house. A house that sits on forty acres. Carver also has goats, chickens and a few cows. He knew a working dog like Shrek needed to work to stay healthy. Carvers little farm gave Shrek all the stimulation he could handle. Carver had been planning a hunting trip and was sitting on the porch organizing his gear. Kyle Torrence is a teenager son of single mom who lived up on the end of Carvers dirt road. Kyle had started hanging around Carvers farm shortly after Carver has moved in. He spent most of his after school hours with the ex SEAL. Carver started paying him a salary for chores that the kid could handle, and that Carver preferred not to do. The arrangement benefited them both. Right now Kyle will be looking after Carvers little farm while Carver goes hunting. Carver tells him he will be gone for about five days. Carver and Shrek then head for Schoepe Boy Scout Camp. Jennifer Blevins is the director for the camp and she's good friend of Carvers. Carver is also going to the Indian Reservation to hunt some coyote's who raided his chicken coop and killed several of his hens. Of course he won't be telling anyone about this illegal act. The Schoepe Boy Scout camp, nicknamed Lost Valley, is three thousand acres and hosts boy scout troops from all over the Southwest for weekend training and activities. Its also the backroad into the Los Coyotes Reservation. This is the way Carver will go to kill those coyote's. His hunt will be successful. Harold Kinney, the camp ranger, was the other full time resident of Lost Valley. Kinney was a former Marine and was responsible for making sure the camps physical assets were maintained and that supplies never ran low. He and Carver were also good friends. The Marine and the ex SEAL were always kidding each other. Captain Lauden and ex Navy pilot who now works for Mercury Rising a private jet chartering company based in California. He's currently flying from LA to Chicago. One of the cabin stewards tells him that one of their VIP passengers a WHO scientist looked like he wasn't feeling to well. The man was an infectious disease scientist was being transferred to Africa to help stem a growing hemorrhagic fever epidemic. Having a sick scientist on his plane doesn't sit well with Lauden. He has his co-pilot Lou Rinck go and check on the man. This one has Carver, Shrek, Kyle, Jessica, Kinney, the Gringleman kids and a set of twins who were left who are left at the camp by their Father who's headed for Chicago, a trip he nor his trophy wife will survive, a group of boy scout parents who tell Carver and the others about an outbreak of Ebola which is the first time Carver, Kinney or Jessica have heard it, an infection that infects humans and animals, a Carver who heads back to his place to collect Kyle, his animals and all the supplies he has, a Carver who heads out to get Kyles Mother who manages a resort, a woman who takes her responsibilities seriously enough to endanger her life from the undead who are everywhere, a Carver who finally gets her back to Lost Valley, a Lost Valley that will become a refuge for Carver, Kinney and some of the parents who come in for safety, a Jessica who headed to San Diego and her boyfriend, a Jessica they haven't hear anything from, a Carver who uses his skills to help them all, coyotes who have been bitten and turned into something monstrous and Carver, Shrek and those with them doing their best to beat the odds, survive and stay alive. First of all, there is no such thing as a retired SEAL...once a SEAL...always a SEAL. So, will have to call John Eric Carver, a SEAL As for Shrek, Carver's trusted companion, he continues to fight along the side of his war time buddy, Carver. This is an intriguing story which is set outside of San Diego, California, and features a Virus on the move. The fact that it is set in a Boy Scout Camp adds to the drama.... Lots of action to keep the reader engaged in this one. Feel this is a welcome addition to Mr. Smith's 'Extinction Cycle' series... Not sure how I missed it a few years ago, but glad I found it now. And, I will check to see what other novels this author has written..
5.0 out of 5 starsANOTHER GREAT KINDLE WORLDS ADDITION TO THE "EXTINCTION CYCLE SERIES "
"Extinction Cycle: Lost Valley by Walt Browning is another great Kindle Worlds Book and one you can read alone or afterward maybe decide to check out and read the "Extinction Cycle Series". Either way you choose you can't go wrong as with this story John Carver and his dog "Shrek" have moved to the mountains for some quiet time and to get away from all the craziness that happens around big cities. As they're enjoying the life they have made for themselves, they missed out on the beginning of the end, but very soon it comes to them. This book is definitely a 5 star all the way and one I hope everyone reads and enjoys. Walt Browning has done a great job on this story and I encourage everyone to also check out his other books he has written in kindle. Walt Browning rocks!!!!! 5.0 out of 5 starsWhat a fantastic addition to the Extinction World! Absolutely love this addition to the Extinction World. Definitely more like a full book too. Fantastic story of Carver, a retired SEAL, and his dog Shrek (love him just like Apollo) as they learn to survive in a world dominated by the monster Variants (or Asps as Shrek calls them). The story, set in the mountains near San Diego, is complex, exciting and definitely lives up to Nick Smith's World. One thing Walt does occassionally is show the world thru the eyes and thoughts of Shrek, no idea how he does this so well but it works perfectly in the story. Guaranteed winner here and I would love more books with Carver and Shrek! 5.0 out of 5 starsGREAT Read. I really enjoyed it. This was a really exciting and lots of edge of your seat reading. I did not like the fact that the zombies were FAST because it makes it more dramatic for the humans in the story. (And more worrisome for us readers, LOL) I so recommend this book and I am going to buy the next one as soon as I am done posting this review. Parts of the story were told from the dogs point of view, which is for me, is unique, and I enjoyed it quite a bit. Have fun reading it.